National Assembly (NA) deputies yesterday debated the draft Law on Sea and Island Natural Resources and Environment. It will form a legal framework for the State’s management of its sea and islands. Phan Xuan Dung, chairman of the NA Committee for Science, Technology and Environment, said the draft law doesn’t stipulate the management and exploitation of any specific natural resources already regulated in other documents. Instead it regulates mechanisms and tools that will be used to co-ordinate sectors at all levels to ensure that marine resources are used effectively and protect the environment, he said. 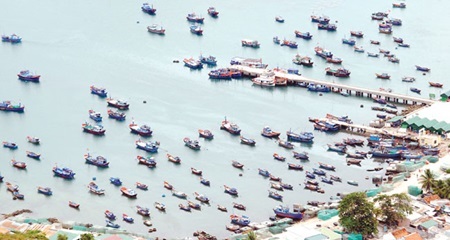 The draft law extends amount of time Viet Nam will use to build a strategy on using sea and island natural resources from 10 years to 20 years. It also outlines conditions foreign organisations and individuals must follow when doing research in Viet Nam’s seas or on its islands. Deputies agreed with the changes overall. But Doan Nguyen Thuy Trang from HCMCity said it lacked specific mechanisms on co-ordiation between ministries and localities. Meanwhile, Deputy Bui Thi An from Ha Noi recommended forming a new ministry to oversee State management of island and sea natural resources and environment. They should also manage the foreign organisations and individuals doing research in the area, Deputy Trang said. Vice Chairwoman Nguyen Thi Kim Ngan said the drafting board would keep reviewing and amending the draft law based on deputies’ opinions before submitting it for NA approval. NA deputies yesterday also discussed the draft Law on Referendum, in a bid to promote democracy and increase citizens’ influence on lawmaking. The draft law sets out the organisation of referendums, the legal effectiveness of their results, referendum violations and punishment methods. Nguyen Van Quyen, president of the Viet Nam Lawyers Association, said the draft law would help the country realise the regulations in the 2013 Constitution and complete the Vietnamese legal system. It would also allow people 18 and over nationwide to participate in the national decision-making process, he said. Phan Trung Ly, chairman of the NA Law Committee, agreed it was necessary to write a law enabling people to express their views on important issues. Some deputies suggested regulations on the types of issues that would be chosen for referendums and their scale. Ly said it would be difficult to define specific issues that would necessitate referendums. During different time periods the country would require different debates and solutions. So, the draft law only regulates common referendum topics, including Constitution issues, he said. The NA is responsible for deciding which issues would be put up for referendums, based on recommendations from the NA Standing Committee, the State President or at least one third of the NA. Quyen added that if the issue affected a province or city, the NA could decide to hold a referendum in the locality. The committee suggested that a referendum should be deemed legally binding when 50 per cent or more of eligible voters turn out at the polls. Then, those with 50 per cent or more voting in favour would be recognised, he said. Deputies discussed the draft amended law on Administrative Procedures in the afternoon.